If millennials think of a headphone, they think of Skullcandy. The brand is quite popular and famous amongst the young generation. Skullcandy Crusher headphone can provide you with true music experience with its solid bass base. This Bluetooth headphone resonates the sound like no other headphone in its league. The sound of Skullcandy Crusher headphone is great with some amazing features. The deep sound effect will transport you in some other world and that makes this headphone different as compared to other headphones. The best part about the headphone is its seamless integration. It gets integrated with any Bluetooth device you pair it up with. The sound is similar to an iPhone as well as your laptop. Skullcandy Crusher headphone has a passive noise isolation feature and that is again a great feature of this headphone. Unlike noise canceling, the sound won’t be completely blocked in a noisy environment. But, with this feature, your audio would be clear and crisp. The headphone has a deep immersive audio that gives you a great experience of listening music of different genres. Skullcandy Crusher headphone features a steep optic base, which can give you a great experience every time. The performance is good according to price. If you are looking for a low-end comfortable headphone for all your needs, then this is the one for you. It’s purely designed for music so it’s great for your music listening. The sound of the headphone is amazing and it appeals to all the music lovers. Is Skullcandy Crusher headphone good for gaming? Well, yes you can use it for your gaming needs. As the sound is crisp with bass, you can hear every sound clear. You would feel great wearing this pair for your gaming. Skullcandy Crusher headphone is good for the audio bass. If you need to buy a headphone for pure music listening, then its a great choice for you. It plays on its bass strength to give you an awesome performance every time you hear a song. For your long playlists, this will surely work for you. Skullcandy Crusher headphone is not so good for your traveling needs. It does not have the noise-canceling feature, so you can still hear low-frequency sounds from the ambiance. As it features passive noise isolation, it only blocks some noises. But, the audio and performance of the headphone are so good you won’t really miss any other feature. There are many great features of Skullcandy Crusher headphone; let us look at some of the key features. Skullcandy Crusher headphone gives amazing seamless integration with any Bluetooth-enabled device or any device you use. The headphone has a very powerful base that you can not only listen to but also adjust according to your need. The headphone has great custom-tuned drivers and amazing memory foam ear pads that provide clear sound and cut the noise sound. Skullcandy Crusher headphone provides hours of music listening with a great battery performance. The battery life can last up to 40 hours. The headphone is available in wired and Bluetooth connectivity and that makes it quite popular. Skullcandy headphones are available with passive noise isolation feature that makes the audio pretty clear. Skullcandy Crusher headphone has a fast-paced charge feature. 10 minutes of charging can give you two hours of playback. None of the headphones can give you this kind of performance in charging. The driver size of the headphone is 40mm and the weight is around 275g. The headphone is available with a 3.5mm Backup AUX Cable for complete flexibility. The headphone is available with a Micro USB to USB Charging Cable. Skullcandy Crusher wireless simply transforms your music and your movies with all-new stereo haptic bass, which delivers deeply immersive dual-channel for great performance. The premium acoustics of the headphone and amazing stereo Haptic bass work together to take your media to a whole new level. You will be simply amazed by the performance it offers. The headphone features call track and volume control. So, it gives an easy access to all the buttons and features. Skullcandy Crusher headphone has a build in microphone feature and that lets you make all your phone calls right from the headphone. You don’t have to manually operate the buttons if you need to make a call. The headphone comes with a protective travel bag so that it remains safe while traveling. Skullcandy Crusher headphone does not have a rechargeable battery or remote. "DUAL DRIVER IMMERSION: Crusher utilizes two full range 40mm audio drivers, and two additional subwoofer drivers that work together to deliver an immersive audio experience with powerful bass you can feel." "ADJUSTABLE HAPTIC BASS: Adjustable bass levels allow you to fine tune your bass experience to find that perfect balance. " "WIRELESS FREEDOM: Bluetooth functionality and up to 40 hours of rechargeable battery life allow you to take the Crusher experience on-the-go. Crusher's rapid charge functionality offers up to 3 hours of listening with just 10 minutes of charging and a full charge at 2.5 hours of charging"
The headphone is comfortable if you wear it for longer time duration. Its light in weight and the ear cups are completely padded to give you a great support. There is no pressure on your ears as well. At times, the headphone can be tight if you wear it continuously. The headphone is bulky, so comfort also depends on the person wearing it. It’s ideal for mid-size and big size head as well. Your comfort affects your overall listening experience. This headphone is not too good in comfort and not too bad. The fit is also ideal depending on the size of your head. Skullcandy Crusher headphone has a passive noise isolation feature so it lets you hear your audio clearly. As it lacks the active noise-canceling feature, it does not block the noises from the environment. The headphone prevents little high-frequency noises that decently seals the audio giving you a great experience. But, you can’t expect complete noise isolation. It does not cut the traveling noises or the noises that you hear in a lively environment. The headphone can also leak if the volume is on the higher side. In the mid-range, it blocks the sound to a good extent. The headphone is light in weight with decent comfort. It can fold in its form to give you that added flexibility and portability. As the headphone is made from the plastic body, it is not so durable. You need to be careful when you use the headphone. The headphone can rattle when the bass is high and that is again a turn-off. The headphone has a mediocre built. If you like stylish headphones with great designs, then you may be a bit disappointed here. The build is sturdy though not so great. There is no separate case for headphone and that is again a drawback. Skullcandy Crusher headphone has two different drivers and that helps to enhance the overall sound experience. The drivers help to increase the bass and reduce the distortion to a good extent. The low range of the headphone is quite good. The mid-frequency of the headphone is not that great and it can also crack at times. The high range of the headphone is not only crisp but also clear. The performance of the headphone on the high-frequency range is amazing and this makes it a great choice for music lovers. If you like bass base, then this should be your ideal choice. The battery performance of the Skullcandy crusher headphone is amazing. You can enjoy up to 40 hours of listening without the tangle of cords. The battery performance of this headphone is good as compared to other headphones that are available in this range. The best part is you can charge the battery on the go. With ten to fifteen minutes of charge, it lets you play your music for up to three hours. This rapid charge feature makes this headphone truly popular and sets it apart from other similar models available. If the battery performance is great, your experience will be great. It has a deep bass base. The price is quite attractive. The level of bass can be adjusted. There is no isolating seal. There are limited inbuilt controls. 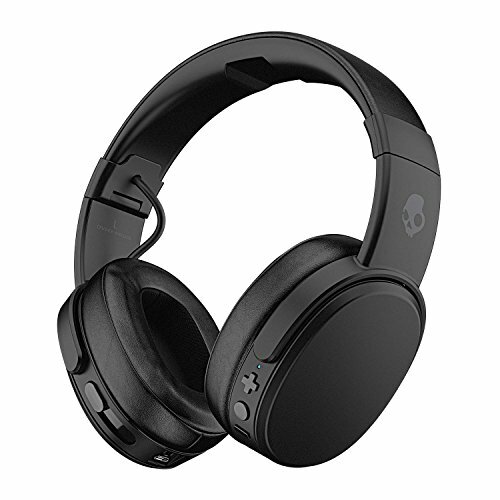 The Skullcandy crusher headphone is good if you are looking for a budget headphone. The performance is good but it’s not that amazing. The sound quality is decent but the bass can be adjusted according to your need. There is no noise-canceling feature in this headphone and that is a major drawback. It won’t really seal the noises around to give you a great audio experience. But, again it features passive noise isolation that is great for low frequency. At this price, this feature is also good. The headphone can also leak if the volume base is too high. It’s great for intense listening sessions as the sound is great. The headphone is not meant for studio needs. The connectivity of the headphone is good if you compare it with other best selling headphones that are available. The headphone with over the ear style is great in looks as well. The body is made from plastic but looks wise it’s attractive. The bass boost effect is simply great so you must consider this headphone. Overall, it is a great sounding headphone with a good performance.